By the way has anyone seen the Chanel ice cube bag? I personally think its disgustingly tacky!!. I haven't seen the Chanel Ice Cube bag ..you have to publish it ahaha. I just hope the iceberg was put there for a reason , the reson to make people aware of global heating and not cooling. Because if we don't protect our nature, there will be no more need for Chanel Coats and woolen Boots. Wow, what an amazing collection! 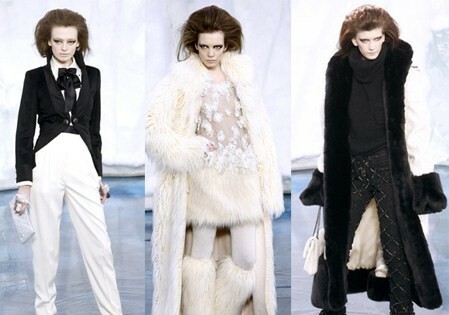 Karl always surprise us with original ideas every season, I love the black and white contrast! The set IS incredible, though it makes one wonder... can designers really compensate for a mediocre collection with some mindblowing set design? 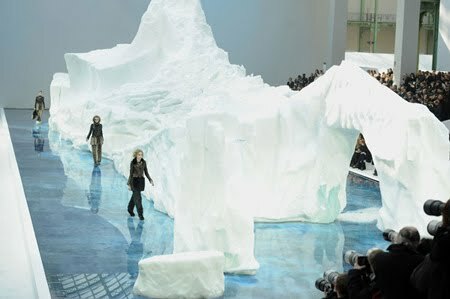 Not to mention only people like Lagerfeld can afford to build enormous icebergs on the runway!